Snow White and the Huntsman is the second re-imagining of the Snow White fairytale to hit screens this year. It was hard to imagine this film being be as bad as Tarsem's Mirror Mirror, but it comes pretty close. 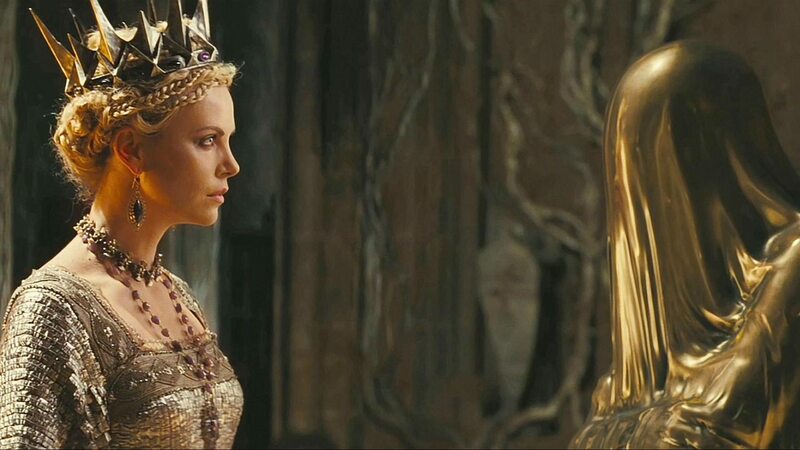 Helmed by debut director Rupert Saunders, we follow the titular heroine (Kristen Stewart, Twilight), on an epic adventure, finding an unlikely ally in the huntsman (Chris Hemsworth, Thor) dispatched by the Evil Queen (Charlize Theron, Young Adult) to kill her. The Queen, having betrayed Snow's father and taken over his realm, learns that her agelessness and immortality (her power) can be undone by Snow, proclaimed by the 'Mirror on the Wall' to be the fairest in the land. Having escaped her imprisonment in the castle, and survived the Dark Forest, Snow and her companions, which also includes the Prince (Sam Claflin) long enchanted by her beauty, find themselves in the presence of seven dwarves and leading an army for an assault on the Queen's castle. 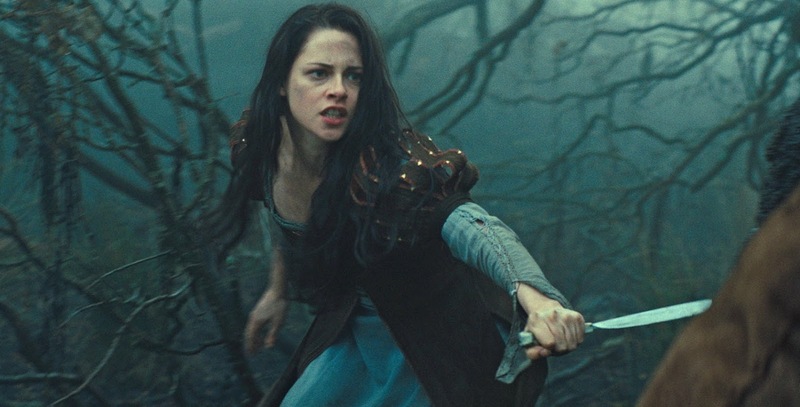 Snow White and the Huntsman is dull and dumb, with an episodic script that fails to thrill or engage, does none of the cast any favours in the dialogue department and is confused about whether to honour the Grimm fairytale, or reinvent it. As a result, there are a few captivating moments of inventiveness and magic - the design of the dark forest and the terrifying creatures that dwell within, and the beauty of the detail that went into the fairy forest was indeed impressive - while some pretty visuals successfully distracts one from the lackadaisical plotting and unconvincing performances. Despite some well-conceived fantasy, you can't overcome the feeling that everything has been borrowed from something else - the forest spirit resembles the one from Princess Mononoke and the climactic battle feels like it has been plucked out of Robin Hood. The acting is universally poor. Kristen Stewart, who is undeservedly bashed post-Twilight, actually has very little dialogue. She mumbles her way through and spends most of the time just staring (and scowling) at her co-stars. She does deliver one speech to rouse the troops and it is very unconvincing, but the issue is simple, she was miscast and stuck in Bella Swan mode. Chris Hemsworth's Scottish accent comes and goes, and while he looks the part during the physical parts of the role, he has absolutely no screen presence at all. 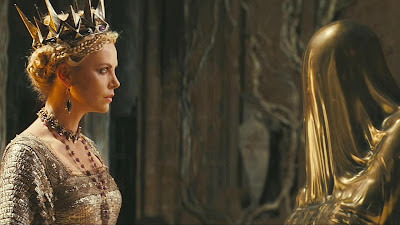 Charlize Theron is terribly over-the-top as the Evil Queen, yelling and delivering every line slowly, and never coming across as being threatening. You have to wonder why the likes of Ian McShane, Ray Winstone, Nick Frost and Eddie Marsan would agree to be a part of this. Their Dwarves serve almost no purpose; they aren't entertaining and it is reasonable to question their involvement because their scenes in the middle aren't particularly interesting and cause the film to drag. There is something amiss about the technique used to digitally transmute the actors faces onto small bodies. Fans of Arrested Development will laugh at one particular scene, because it offers up one of the finest opportunities to chuck in a 'her' joke ever. Inevitably, comparisons are going to considered between Snow White and Tarsem's Mirror Mirror, and while some of the visual effects and grandly staged action sequences in the former are impressive, Mirror Mirror's playful reinvention is actually a LOT more fun, and I think the Roberts/Collins pair are ultimately more suited. Also, at least the inclusion of the Dwarves added some comic value and weren't completely obsolete. 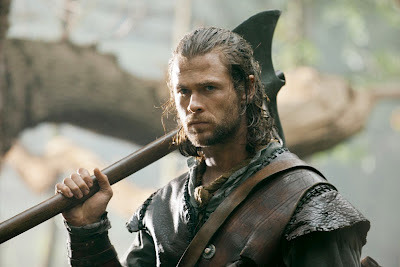 Snow White and the Huntsman was disappointing. There are plot inconsistencies, terrible pacing and the entire film lacks energy. The trailers looked good and promised a dark and grim twist on the fairytale; and it really looked like Charlize Theron would be a scene-stealer. The final act didn't succumb to cliche as much as expected, because a love-triangle is introduced and then thankfully never materialises, so that was a pleasant surprise. This is certainly not for kids, but at the same time the script is too silly for adults, which is a shame because there are glimpses of the unconventional gothic fantasy/horror this promised to be. I didn't like the movie but I disagree on Theron and Hemsworth - while script was poor they really created good performances, especially Theron who whenever was on screen made the movie so much better. Good review, though! I'll jump in. You said that she was not scary with all that yelling and I agree on that. But what I personally saw in her performance and what quite affected me in this film -- which I, by the by, loved -- was the pain in that yelling and in her eyes that she rendered. I saw Ravenna not as a witch who was born to be vicious and all that, but as a woman, as a personality, who could've been different, if only fate would have been kinder to her. Yeah I agree with Sati. Theron could have really shined had they let her, or better, made the movie about her. I was pleasantly surprised by how much I liked Hemsworth in this. Also, I dunno, I felt the film complimented Stewart but then made her out to be a bimbo. It was disappointing given it's potential. I was appalled by how bland and boring Stewart's character was. It's not all her fault because the script sucked. Theron could have been a really interesting character, but I thought she was at-times laughably unconvincing. A real shame. For what it's worth, I agree with you on Theron. To me it seemed that to be evil meant you had to shout every line and make lots of faces. While she's been excellent in movies, this wasn't one of them. I loved her performance in Young Adult. She has immense talent, but I didn't like her here.